The Dragon, majestic ruler of the sky and most popular mythic creature of all. 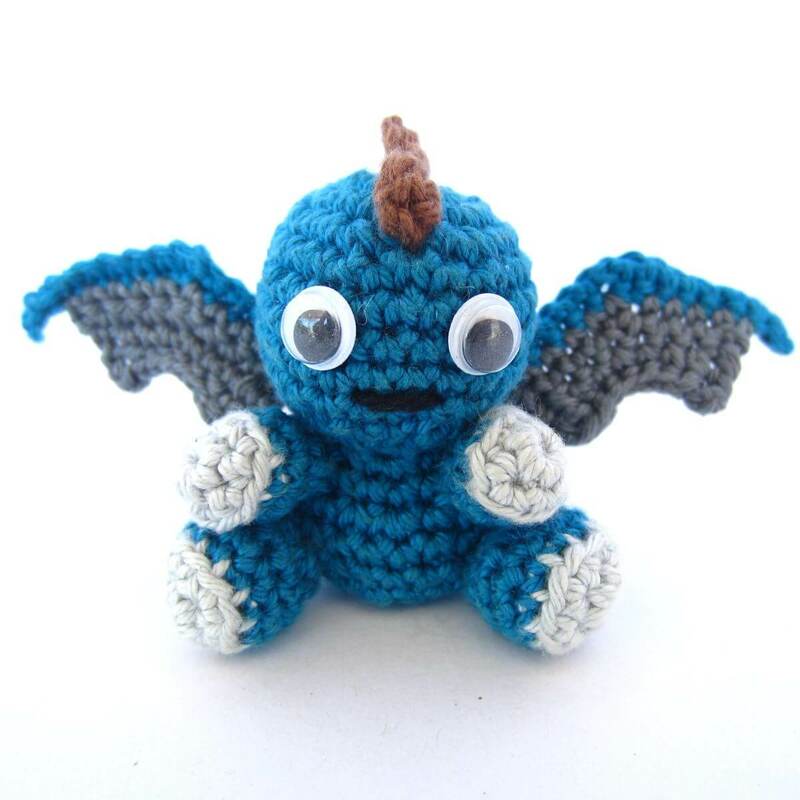 The dragon appears in many roles, as keeper of epic treasures and lore, as faithful companion and mount or as little crocheted plushy friend to take with you. The crochet dragon is easy to work and comes with all parts that make a dragon a dragon, wings, spikes and in this case a convenient size. 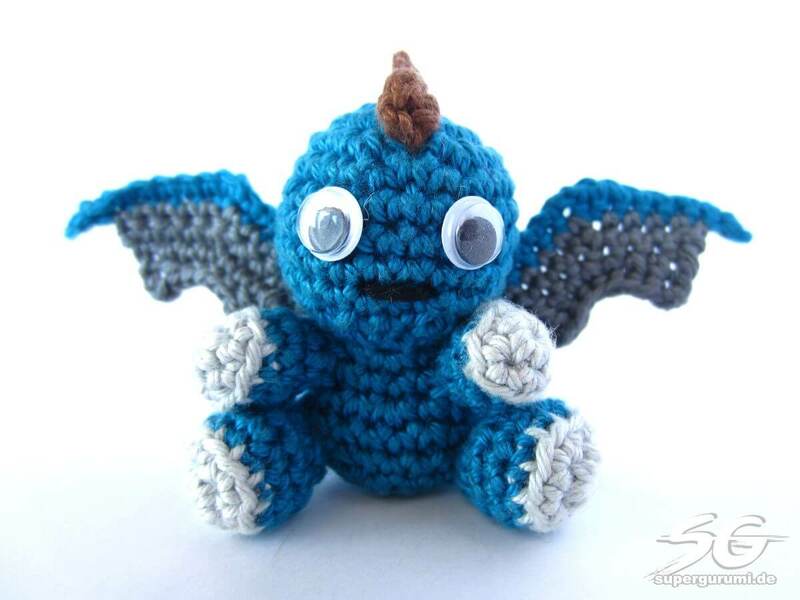 The here depicted Amigurumi Dragon has a height of 7 cm (2.75 inch) and was crocheted using the “Schachenmayr Catania” yarn and a 2.5 mm crochet hook. Using a bigger yarn and/or crochet hook will result in a larger dragon. Yarn Colors: Turquois yarn for the dragon skin, grey yarn for the wings, light grey yarn for the feet and hands, brown yarn for the spikes. The head and body of the dragon are crochet in one piece in spiral rounds with single crochet stitches. If you are using safety eyes instead of wiggly eyes take care to attach them after Round 11, same goes for filling the head part with polyfill otherwise it will be difficult to do so later. In Round 18 you are instructed to crochet only into the back loops, the back loops are the loops laying on top of a stitch in the rear. 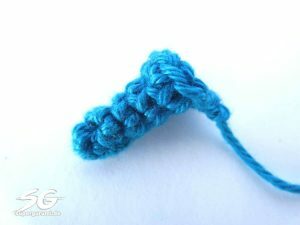 You start making a Magic Ring using the turquoise yarn. Cut yarn, close the opening and weave in the leftover yarn. 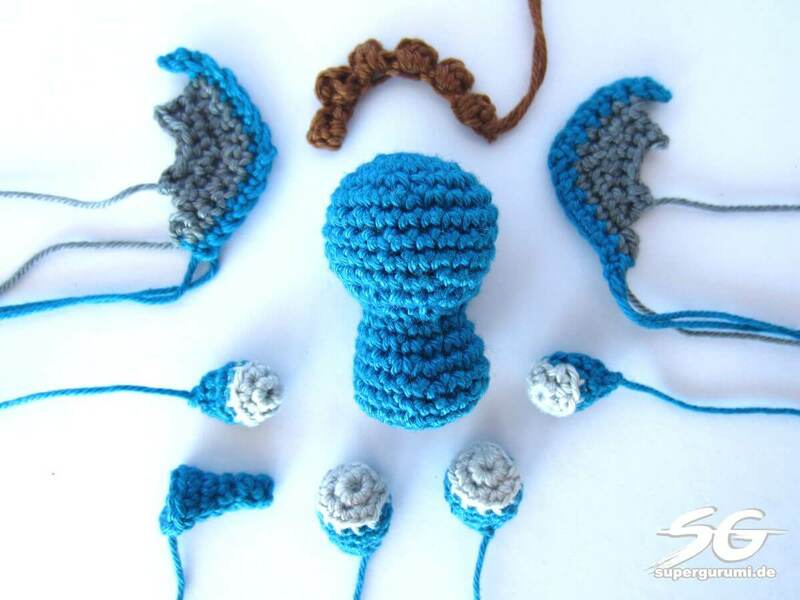 The dragon legs are crocheted same as the body in spiral rounds with single crochet stitches. Crochet again in Round 3 only into the back loops, the loop in the rear on top of a stitch. Crochet 2 dragon legs. You start making a Magic Ring using the light grey yarn. Cut the yarn generously and leave long tail for sewing. 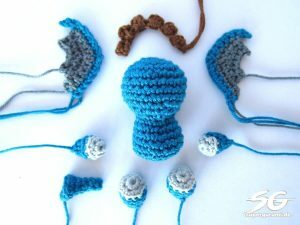 The arms are crocheted in spiral rounds with single crochet stitches. Round 3 is crocheted only into the back loops, the loops in the rear. Crochet 2 dragon arms. 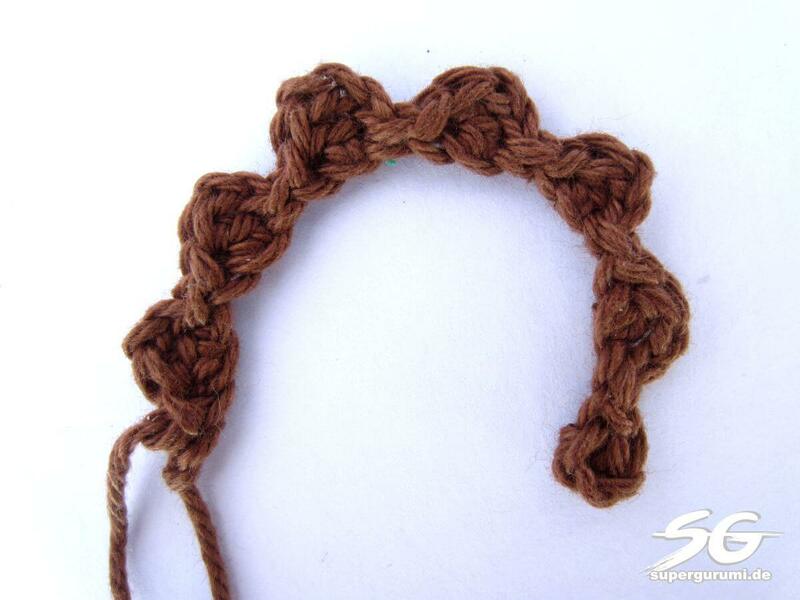 The dragon tail is crocheted in spiral rounds with single crochet stitches. You start making a Magic Ring using the turquois yarn. The spikes are crocheted in rows out of a chain with single crochet stitches and slip stitches. Do a slip knot on your crochet hook with the brown yarn. 1. Spike: 1 double crochet stitch into the 2nd stitch from the crochet hook. 2 slip stitches. 2. – 7. 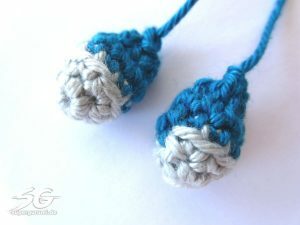 Spike: [ 2 chain stitches, 1 double crochet stitch into the next stitch on the chain from Row 1 and 2 slip stitches. ] Repeat from [ to ] 6 times. The dragon wings are crocheted in rows out of a chain. When instructed to skip a stitch, you skip the next stitch you would normaly crochet into and instead crochet into the following stitch after the skipped one. Crochet 2 wings. 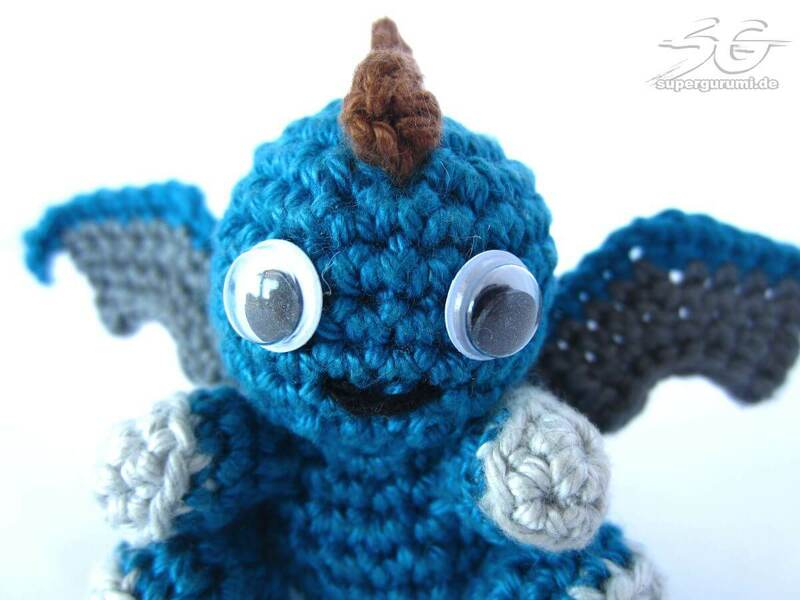 If you use a big and/or soft yarn and the wings turn out floppy, crochet 2 more wings and sew each 2 wings together. 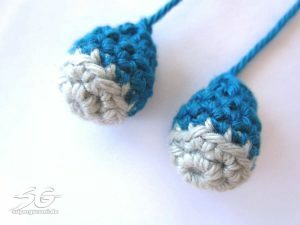 Do a slip knot on your crochet hook with the turquois yarn. 4. Row: 4 SC, skip 1 stitch, 4 SC, 2 chain stitches and turn. 5. Row: 1 double crochet stitch, 1 half double crochet stitch, 4 SC, 1 half double crochet stitch, 1 double crochet stitch. 1 chain stitch and turn. 6. Row: 8 slip stitches. Cut the last used thread and weave it in. Leave the other threads to sew the wings later tothe body. After finish crocheting all dragon parts you should have an assembly kit laying in front of you that should look something like this. Body: If not done yet, close the bottom of the body. To do this take your blunt tapestry needle holding the thread laying at the opening. Stitch with the needle through the front loop of all 6 stitches and pull tight. Push the needle through the now closed opening and let it escape through the side of the body or the head. Pull the thread tight again, cut the thread close to the body or head and knead the piece. The thread should dissapear inside and the bottom is cleanly closed. Legs: Begin sewing the first leg one stitch row over the row with the visible edge (created by the round crocheted only into the back loops). Both legs are the same, so it does not matter which leg you sew on first. Still, sew on the first leg as the right leg. Sew on the second leg around 7 stitches to the right from the first leg. Both legs should be on the same level as the bottom of the body, that the dragon is able to sit properly. Use the pictures as guidance to position the legs correctly. Arms/Front Legs: Sew on the arms 3 to 4 stitch rows over the legs. Take care not to sew the arms onto the neck area (the smallest part between head and body). Take again the pictures as guidance to position the arms correctly. Tail: Sew on the dragon tail in the middle of the backside of the dragon body just over the stitch edge. Spikes: Sew on the spikes from the tip of the tail to the top of the head. Wings: Sew on the wings one to two stitches left and right from the spikes onto the body. Sew on the wings shortly under the neck area, the slimmest part between head and body. 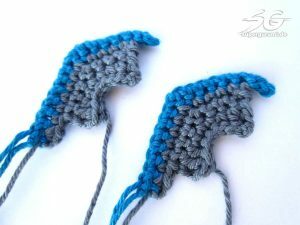 Since both wings are crocheted the same it does not matter which wing is the left or the right. Face: I my opinion simple wiggly eyes with a diamter of 0.7 cm suit the dragon very well, but feel free to give the dragon a different face with different eyes or even features like a snout. Finally stitch a simple straight mouth under the eyes. Take the picture as guidance to position the eyes and mouth correctly. And done it is, your own majestic, litte pocket crochet dragon!